In time to usher in another summer and ahead of appearances at major festivals across the UK and abroad, Snakehips are ready to release their glorious, second single, Days With U, featuring Disclosure and Rudimental vocalist Sinead Harnett. With the vibe of long, hot, hazy days coursing through its veins, Days With U sounds both retro and fresh and as dreamily laid-back as it is dancefloor-friendly. Driven as much by melody as by hip hop beats and shimmering synths, it’s a song about heartbreak that, somehow, sounds resolutely life-affirming. With a debut album well underway and due out early next year, Snakehips have decided it’s time to reveal themselves as 24 year old Londoners Oliver Lee and James Carter. Despite a shared home city, the pair met on separate business trips to Hong Kong, where they bonded over shared musical interests. They shared a flight to L.A., began talking music and booked a studio in which to work on a track. It went so well that within days of returning to London they nudged their laptops together and Snakehips was born. The pair’s first release was a remix of Chicago band Wild Belle’s It’s Too Late; their next a remix of Gold by electronic duo Bondax. Both used only the original vocal, topped the Hype Machine chart and revealed Snakehips’ love of ‘90s hip hop, disco and vintage soul. The reaction to their own music, however, was in a different league. The steamy, sultry, lushly-produced On & On, featuring up-and-coming, Australian singer George Maple, sent blogs in to a frenzy, reached the Top 10 of the iTunes electronic charts on both sides of the Atlantic and caught the attention of Radio 1’s Zane Lowe, Annie Mac, Mistajam and Monki, for whom Snakehips recorded a guest mix. Like Days With U, On & On was a song about heartbreak that sounded like summer. Or as Ollie outs it: “It’s about a bloke George was in love with who didn’t love her back.” On & On’s soulful blend of retro and modern became Snakehips’ trademark. 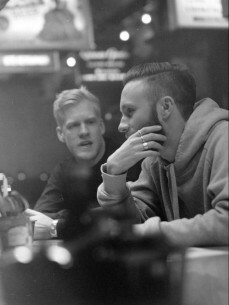 Last year, Snakehips heard the Banks’ song Warm Water and loved it so much they contacted Banks, asking to remix it. She sent the acapella, they added funky disco music, had another blog hit on their hands and were rewarded by being asked to rework The Weeknd’s Wanderlust. After The Weeknd tweeted his praise for their version, it received a million and a half plays in less than a month. In between official singles, Snakehips have put out a handful of sample-based tracks, among them the Annie Mac-premiered Make It and Miss U Always, a love song posted for fans on Valentine’s Day. They sold out a tour of Australia, shows across the UK and were in demand to play clubs and festivals everywhere from Paris, Vienna, Warsaw and Berlin to the Netherlands. The pair’s debut London date, this May, at Village Underground, sold out so quickly a second show had to be added. Most of 2014 so far has been spent working on their as-yet-untitled debut album, which will be preceded by a third single, Falling, featuring Meleka. All releases are on Snakehips’ own label Hoffman West, named after a fictional character Ollie created to get in to clubs for free.